Although the tourbillon dates to an 1801 patent by Abraham-Louis Breguet (yes, that Breguet), it wasn’t until 1977 that a double-axis tourbillon was invented. Even then, it took until the 2000s that watchmakers considered creating multiple-axis tourbillon complications in wristwatches. Thomas Prescher was first in 2003, but Greubel Forsey, Franck Muller, and Jaeger-LeCoultre were already hard at work on their own. The Jaeger-LeCoultre Gyrotourbillon 1 was unveiled at SIHH in 2004 and shocked the world with its advanced design and beguiling motion. It was a leap ahead of the competition, with the beautiful spherical cage highlighting the rotating tourbillon. It was also a landmark achievement for Jaeger-LeCoultre, a declaration of haute horology chops. It brought together 679 movement components and delivered a perpetual calendar too. And the list price of SFr.390,000 (about US$340,000 at the time) was a high point for Jaeger-LeCoultre as well. If you think $340,000 for a watch is expensive, consider Jaeger-LeCoultre’s 2009 Hybris Mechanica package, which sold for $2.5 million and included not just the Gyrotourbillon 1 but also the Reverso grande complication à triptyque, the Duomètre à Grande Sonnerie, and an electronic coded safe to store it all! This original Gyrotourbillon formed the basis for a whole line of Hybris Mechanica watches from Jaeger-LeCoultre. There would be 3 successively improved Gyrotourbillon watches, a new Spherotourbillon concept, a family of chiming watches, and the Grande Complication used as the icon for this blog. In 2019, Jaeger-LeCoultre launched yet another impressive watch, the Master Grande Tradition Gyrotourbillon Westminster Perpétuel, which adds a chime to the fourth-generation Gyrotourbillon movement. These extreme-high-end watches are a wonderful way to enhance the image of a watchmaker, but they don’t exactly sell in volume. The Gyrotourbillon 1 was produced in limited numbers over more than a decade. The original was limited to 75 examples in platinum, then a few more limited versions were produced in white gold, diamond set, pavé, and so on, each more expensive than the last. In total, it is unlikely that Jaeger-LeCoultre built more than 150 examples of the Gyrotourbillon 1 before it retired for good. With the new Westminster model being launched, we checked Chrono24 to find out how well the value of previous Hybris Mechanica models was holding up. It turns out, it’s not so good. This 2012 Gyrotourbillon 1 is unworn with no marks and all original materials. Yet it’s listed for just $169,000 by Vesper & Co. of New York. That’s an amazing 50% discount on one of the most remarkable watches ever made! This is one of the last of the Gyrotourbillon 1 line. In 2012, Jaeger-LeCoultre announced that they would produce a “final” run of 30 in rose gold with an open-worked dial. The price was reportedly €290,000, or about US$350,000. By that time, Jaeger-LeCoultre had introduced half a dozen more Hybris Mechanica models, including the cheaper Duomètre à Sphérotourbillon and the amazing Grande Complication. This must have caused issues for Jaeger-LeCoultre, leaving many Gyrotourbillon 1 watches unsold despite the limited production. 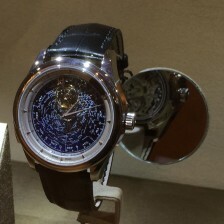 I have seen one or two on display at Jaeger-LeCoultre boutiques and even tried one on a few years ago. What is a dealer to do when they have a hyper-expensive piece sitting in inventory and it’s just not selling? Enter the grey market. Dealers will sometimes offer unsold inventory as “unworn” used, typically at a strong discount. This is the source of many “new” watches at resellers like Swiss Luxury and Jomashop, often with a discount of about 20%. Since manufacturers frown on discounting like this, most will not stamp the warranty card or otherwise reveal the source. This is even more challenging for limited-edition pieces like the Gyrotourbillon 1, which are individually numbered on the case. That’s probably why our example here doesn’t include a photo of the case back! It’s also why Vesper doesn’t list this watch on their web site: It’s likely still sitting in inventory at an authorized dealer who hopes they don’t have to take a $150,000 haircut on this watch. What does this mean for the ultra-high-end watch market? It’s likely that some air has been let out as politics impacts demand from China and the Middle East. It’s also likely that today’s buyers are looking to new models, not a continuation of a now-15-year-old model. And perhaps this isn’t a sign at all: Other Gyrotourbillon 1 watches on Chrono24 are listed for $100,000 more, and newer models are listed above MSRP. Could something else be afoot with this listing?